Side dishes are an often overlooked element of a great meal. Many times, what sets a great meal apart from other similar meals are the side dishes. A poor side dish can really distract from a great entree and a really good side dish can give the illusion of a much better meal. That’s why some of the best side dishes are the ones that are easiest to make. Great restaurants and backyard barbecues have mastered the art of the simple, yet delicious side dish. 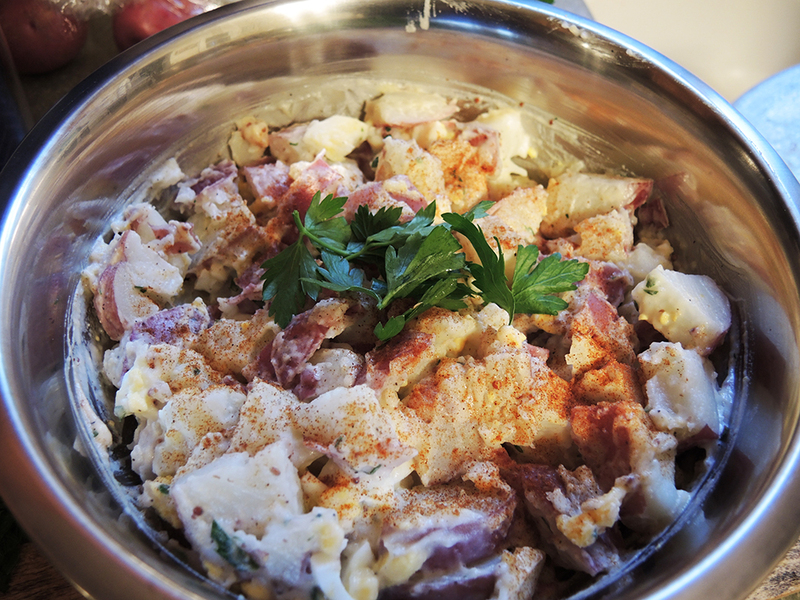 This potato salad comes out really well, but is very easy to make. There are a lot of ingredients that go into the dressing to create a uniquely creamy and tangy potato salad, but almost all of them are easily found in any kitchen. The lighter dressing provides the same creaminess that many people expect from a mayo-based potato salad, but it is also cut with some of the more acidic components of a non-mayo-based potato salad. I consider this potato salad a nice balance between mayo-based potato salads that are often drenched in dressing and the non-mayo potato salads that can lack flavor or come out too sour if not made very well. This recipe combines the best of both worlds. 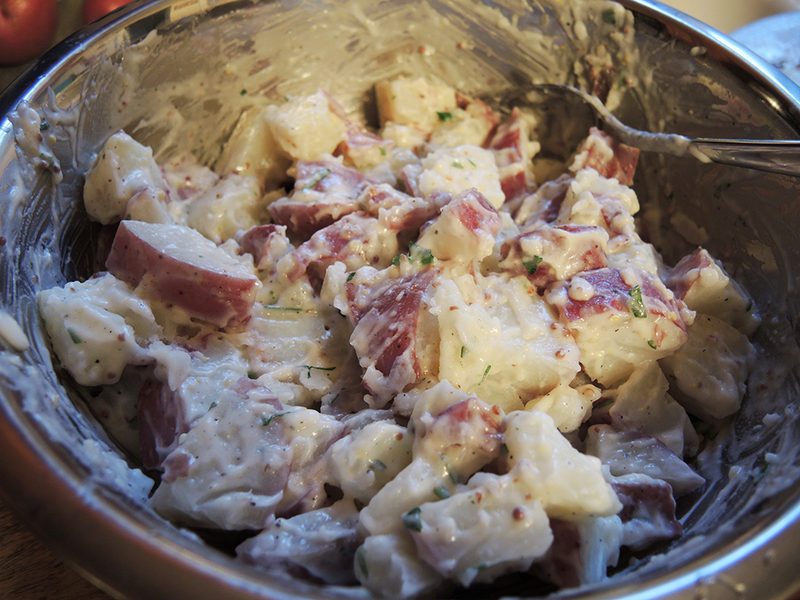 Makes one large bowl of potato salad at 1645 calories total or about 206 calories per 1/8th serving (using light mayo). 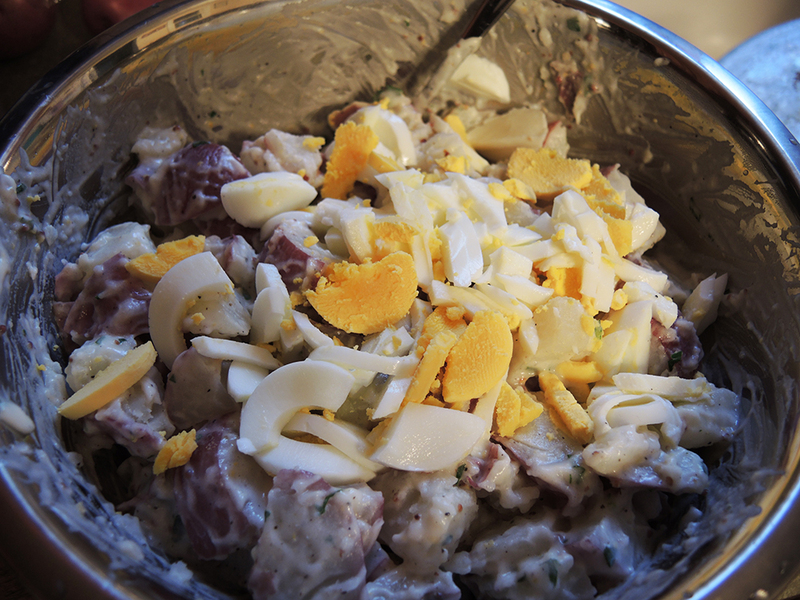 Potato salad with mayo dressing, eggs, and whole grain mustard. 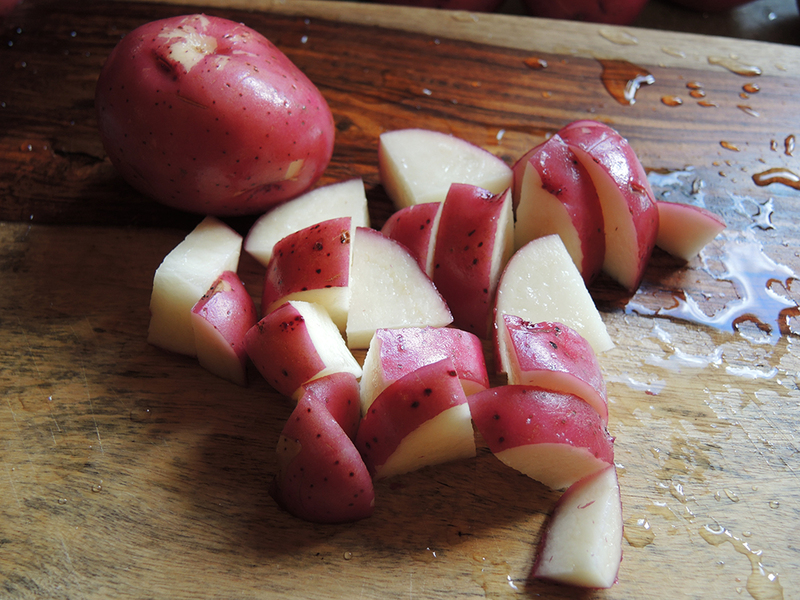 Note: Waxy potatoes like red or gold work best, but you can technically use starchy potatoes like Russets. The excess starch can cause them to crumble though. Optional: Dash of paprika to top the potato salad for color and presentation. 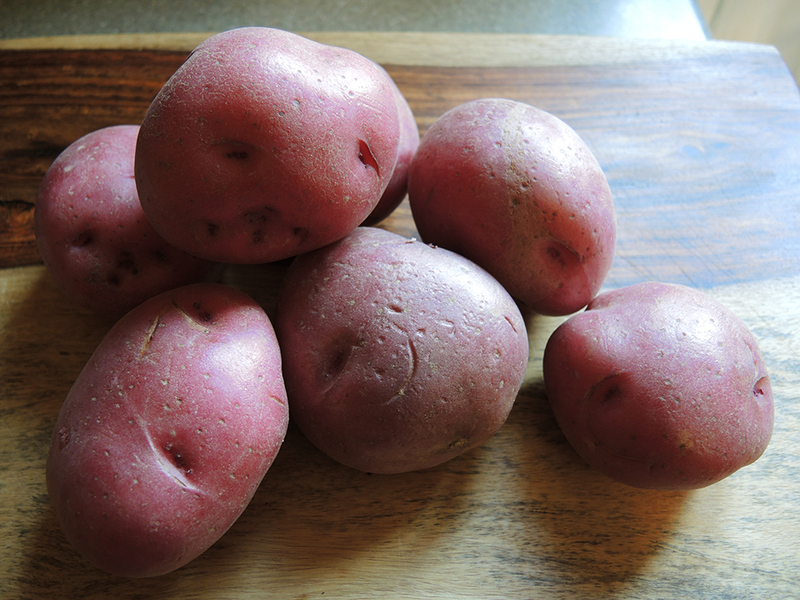 Clean and scrub the potatoes lightly under cold water with the skin on to make sure there is no excess dirt on them. Fill a large pot with cool water about 2/3 of the way and set it on the stove. Cut the potatoes into cubes. I usually do this by halving the potatoes length-wise and then cutting each half into 4 x 3 slices to make cubes. You may need to improvise if you have a very large potato in the bunch. Just try to make sure that all of the cubes are about the same size. As you are cutting, drop the cubed potatoes into the pot with the water and turn the heat on the stove to high if you haven’t done so already. 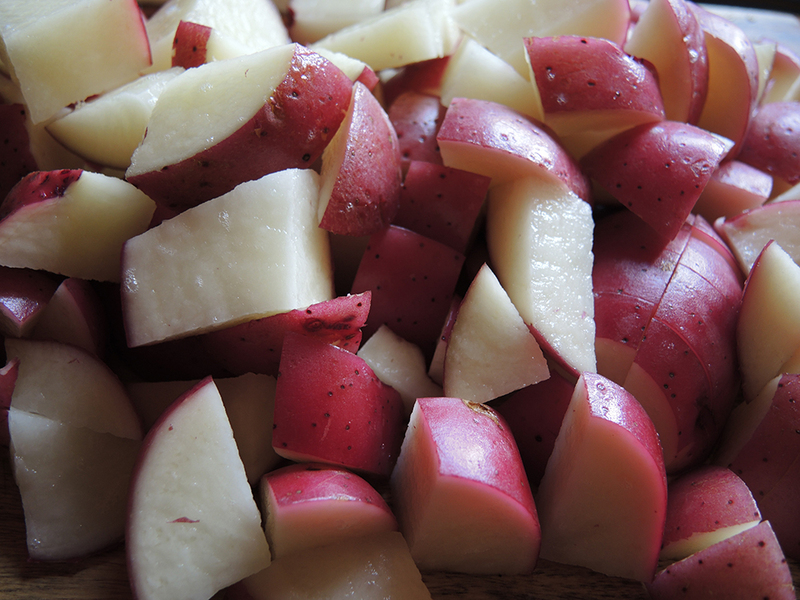 Don’t leave the cut potatoes out of the water or uncovered for too long or the potatoes will start to discolor. People will disagree about the proper way to boil potatoes. Fun Facts: Some will tell you to put the potatoes into boiling water, while others will tell you to always put the potatoes into cold water and then bring them to a boil. From my minimal research, it seems that putting potatoes into boiling water tends to make them grainy and potentially unevenly cooked (i.e. more cooked on the outside than the inside). Cooking potatoes in cool water brought to a boil is good because it warms the potato evenly and avoids graininess while keeping a firm texture. 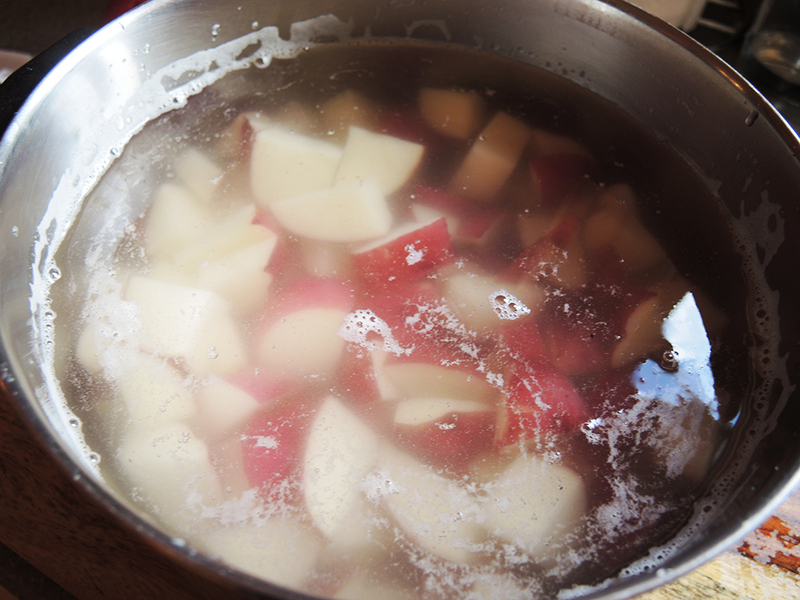 Bring the potatoes to a boil and then lower the temperature to a medium simmer. Leave the pot uncovered and simmer for about 10 – 15 minutes. After ten minutes, use a fork and press against one of the potatoes. It should be tender, but not disintegrate. The potatoes are ready at that point. 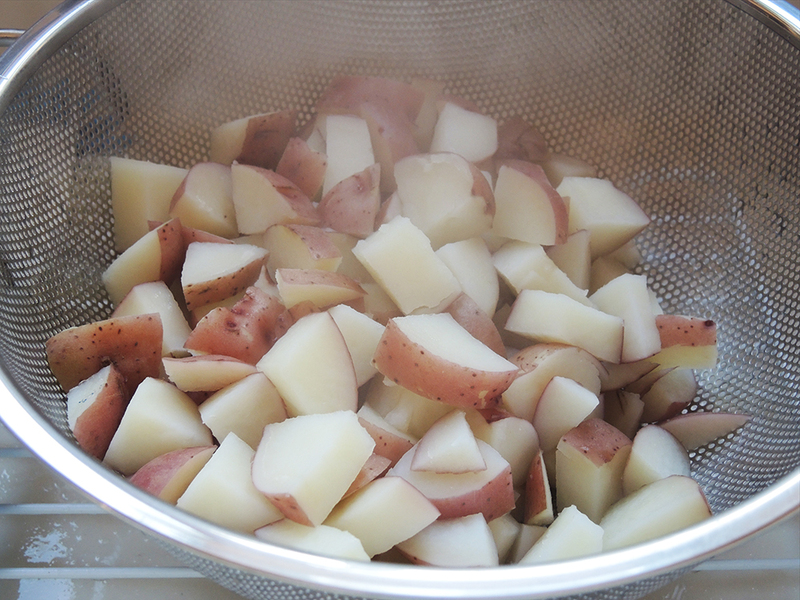 Drain the potatoes in a colander and run a little but of cold water over them to stop the cooking process. 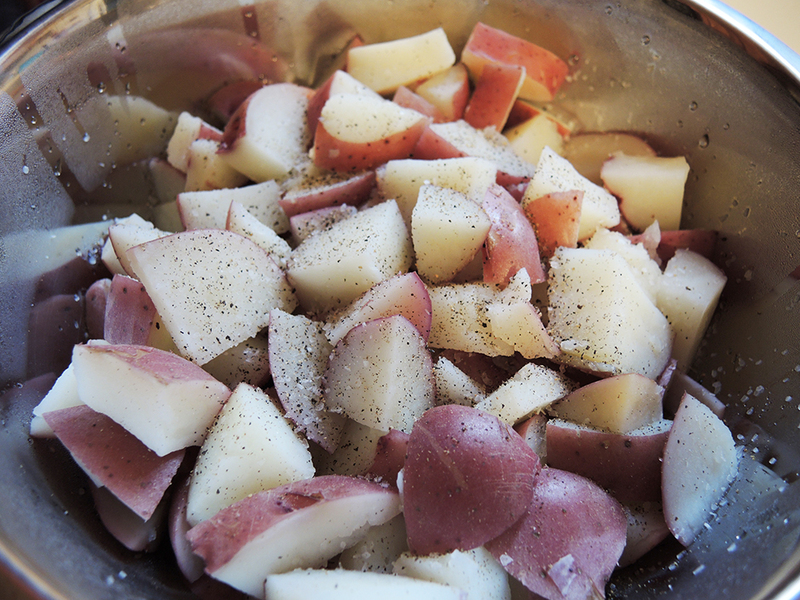 Place the well-drained potatoes into a large bowl, cover the bowl with plastic wrap, and then let them cool. If you have room, stick them in the fridge for half an hour or so. 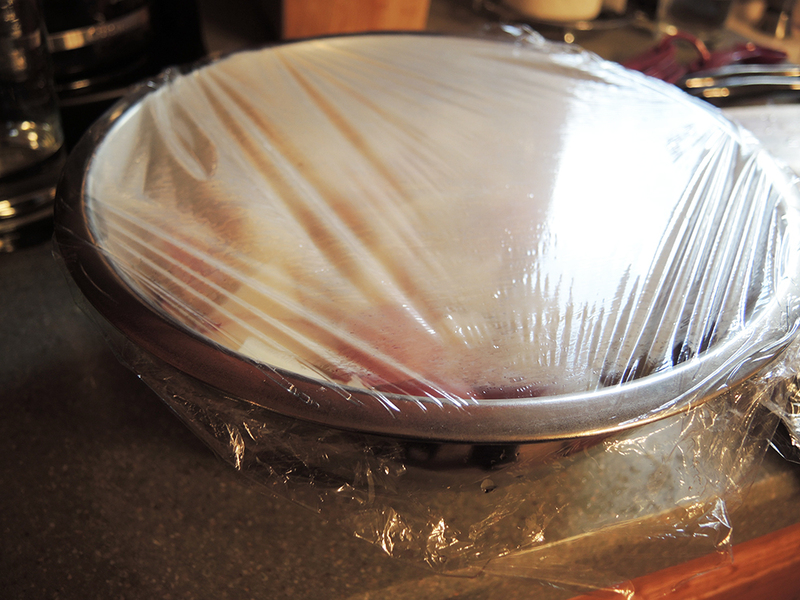 Don’t worry if they steam up the plastic wrap a bit. While the potatoes cool, use this time to boil your two eggs if you want to include them in the recipe. The eggs won’t make or break the recipe, but they do add to the creamy texture of the entire potato salad as well as create another layer of flavor. If you prefer not to add the eggs, that is fine too. 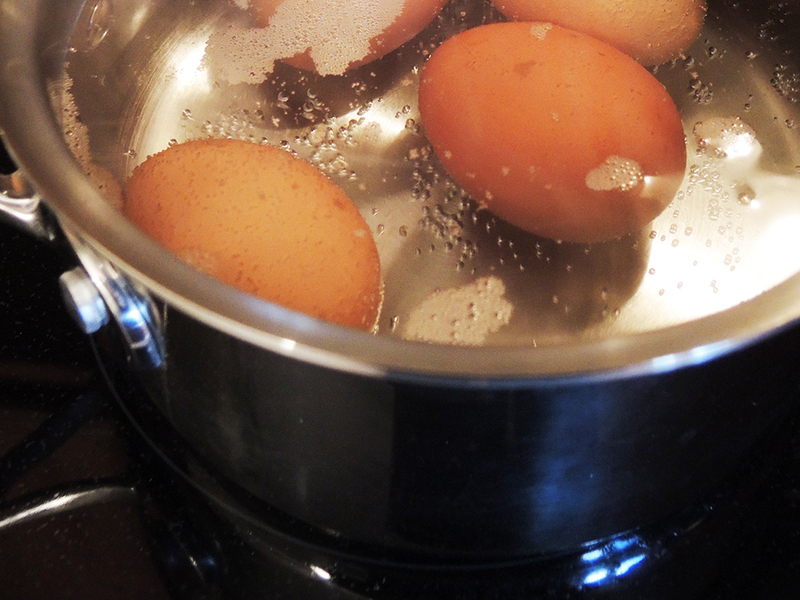 My tip for boiling eggs that are easy to peel with nice yellow yolks is to boil the water first and then carefully add the eggs to the water using a slotted spoon. Let them boil for 10 minutes and then turn the heat off. Remove the pot from the heat and fill the pot with cold water. Dump and repeat a couple of times. Set the pot aside with the eggs until you are ready for them. 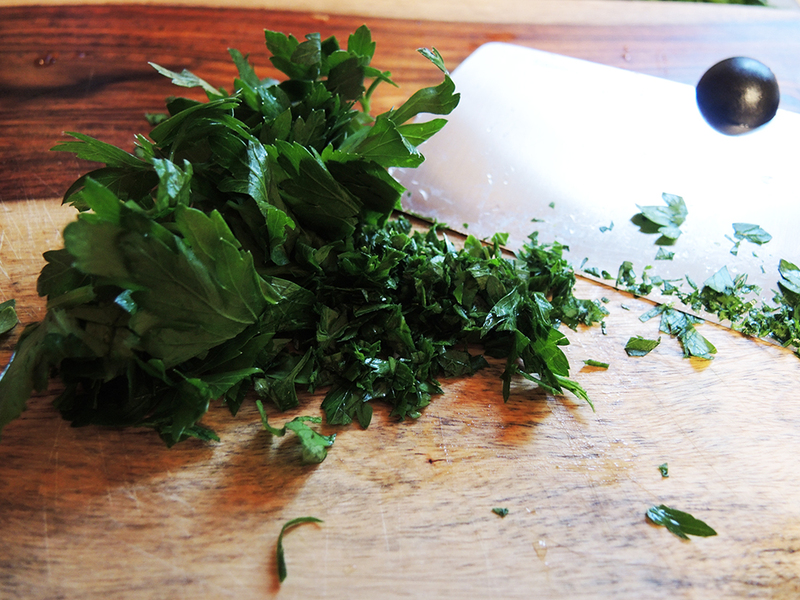 Finely dice the parsley for the dressing using a sharp knife or a food processor. For the dressing start by adding a 1/4 cup of mayo (I use light, but you can use regular mayo if you prefer) to a measuring cup. 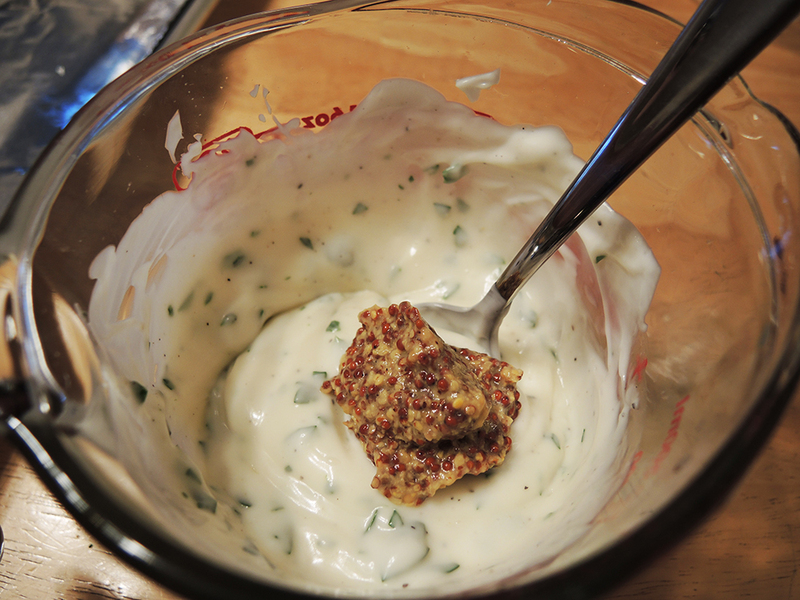 Mix in the sugar, salt, vinegar, black pepper, parsley, and whole grain mustard. Mix the ingredients well. Cover and refrigerate the dressing if you are still waiting for the potatoes to cool or if you want to save the dressing for later. After 30 minutes to an hour take the potatoes out of the fridge, uncover them and season with a pinch of salt and pepper. Add the dressing to the potatoes and mix well, but lightly, using a large spoon so as not to break the potatoes apart. If you want to add the eggs, then peel and chop up the eggs before adding them to the potato salad. Once again mix everything very well, but lightly and then garnish with a sprig of parsley and a very light sprinkle of paprika just for looks and color. Serve the potato salad alongside any dish. 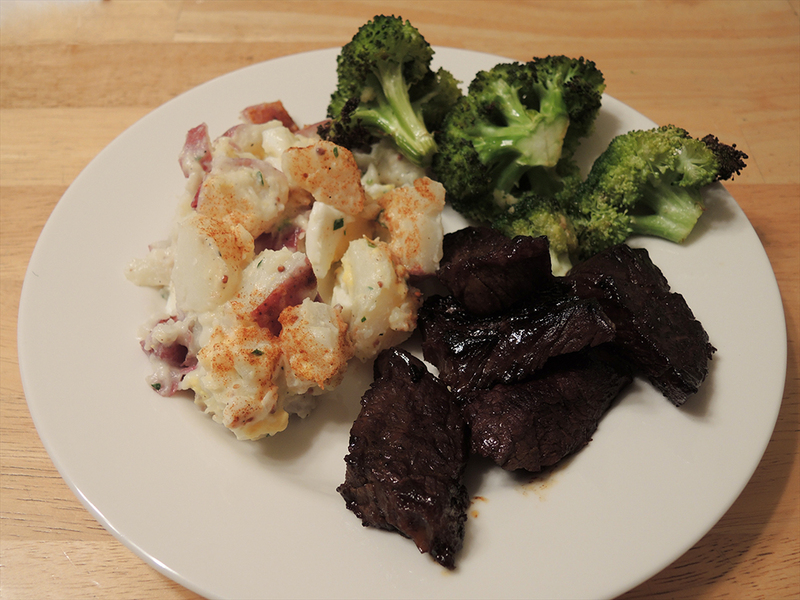 I paired it with barbecue glazed steak tips and roasted broccoli. Oh Yum!!! the final dish with the meat and broccoli look sinfully mouth watering. Funny you should say that! I just nailed down a really good mayo-based slaw recipe as well as a vinegar-slaw that I’ll be posting at a later date. Love me some slaw!